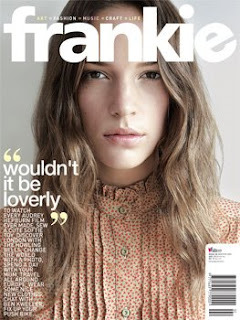 The new (to North America) issue of Frankie is here and I have a copy to give away. You know what to do! I will randomly pick a winner on Wednesday night. Hello Anabela‚ I wouldn't mind putting my name in for the new issue of Frankie. Since moving to Thunder Bay, I haven't been able to find a copy anywhere in the city and miss the magazine dearly. I've never tried for a give away before but couldn't resist this time. The cover is gorgeous! oh my! count me in! Ooh, por favor! That would be lovely. thank you thank you! hope you an Geoff have fun celebrating his bday! oh, you're so charming. i would love to win anything from you. ;) my fingers are crossed. The cover of that one is so cute! I love her little blouse. Maybe it will be my lucky comment. that's funny, this weekend I was browsing through Frankie's website telling myself how good it would be to have that magazine here in France too. This magazine looks very lovely! Here's hope that this is a lucky first comment! I never, ever win stuff. I really, really want to. oh, neat! I've been hearin' about this magazine..it looks wonderful! Oh, please count me in! I've heard good things about this magazine! ohh count me in! looks lovely! Count me in! I have a feeling it's my favourite magazine, even though I don't own a copy. I've flipped through it countless times, why don't I have at least one!? What a nice treat! Count me in. Oh I'd love a copy, I can never find it! i would like to get it very-very much! Do have issues 19 and/or 23 of Frankie? I'll throw my name in the hat . . . Wonderful! With so many magazines folding, it's so nice to find new favorites! Thank you! Over here! (Waving hand furiously in the air). Oooh, looks like a great magazine. I'd love to win. Oh, awesome, hope I'm not too late!